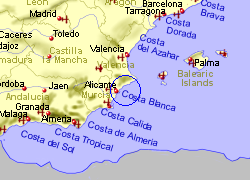 Map of the Alicante Ferry Port area. The ferry port at Alicante is located on the edge of the city, with the main train station approximately 1.5km distance. A high speed rail connetion opened in 2013 offers a journey tim eof 2hrs 20 minutes to Madrid. There is also a narrow gauge train (which runs up the coast as far as Denia) located within 1 km. 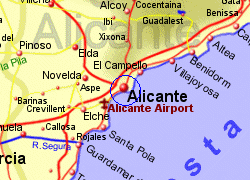 Alicante airport is approximately 10km from the port, with a bus service taking approximately 30 minutes. 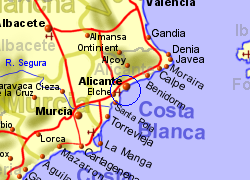 By road, Alicante is well conneted via the A7 motorway and AP7 tollroad for travelling along the Mediterranean coastline. The A3 and A31 motorways connect Alicante to Madrid in under 4 hrs by car.